RealSatisfied has partnered with the Canadian Real Estate Association (CREA) and the Association of Saskatchewan Realtors (ASR) on a limited test pilot of sharing RealSatisfied Realtor reviews on Realtor.ca. The pilot, which ends in October, is limited to ASR members. During the pilot, buyer/seller feedback, testimonials and reviews will be displayed on Realtor profiles. According to RealSatisfied, the adoption rate among ASR has been successful. CREA will continue to evaluate the value of RealSatisfied reviews on Realtor.ca, and has yet to make a long-term commitment. 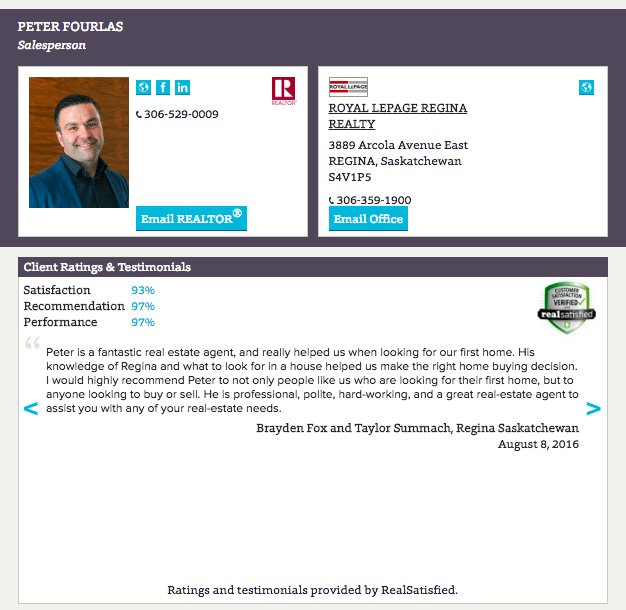 RealSatisfied has partnered with the Canadian Real Estate Association and the Association of Saskatchewan Realtors on a limited test pilot of sharing RealSatisfied Realtor reviews on realtor.ca, Canada’s leading home, commercial and Realtor search portal. “We’re thrilled to be a part of this pilot,” said Jeff Turner, president of RealSatisfied, in a press release. The pilot program, which ends in October, is limited to Association of Saskatchewan Realtors (ASR). So far, 43.9 percent of ASR’s members have adopted RealSatisfied reviews. During the pilot, ASR will gather buyer/seller feedback, testimonials and reviews for its members. “The response we’ve received from Realtors and brokers using RealSatisfied has been overwhelmingly positive,” said Bill Madder, CEO of the Association of Saskatchewan Realtors. “It made sense for us to approach CREA about creating a way for our Realtor members to make greater use of the client feedback they were receiving. The Canadian Real Estate Association is evaluating the success of the pilot program and has not made any commitments beyond the end of the pilot in October.